Correspondence from Dr. Cal Ennis, a former Canadian. Canada has a government run system i.e. single payer; I call it a SPUN-single payer universal system. But also as we all know, there is ALWAYS only one payer, the taxpayer. Canada’s SPUN started in 1970. I lasted until 1978, then I got out of town (along with 25% of all Canadian doctors). So yes in the past few years a small percentage of the population can get some cash care but its only by default because the state run system is broke. There are only 3 countries in the world where the private practice of medicine is officially illegal- North Korea, Cuba and Canada. And so are insurance companies. Private insurance can’t be bought. The government knows all and treats all i.e. Brave New World. Is it coming here? I think the brain trust around Obama wants it and plans it and is hoping that the public will say a pox on all your houses in this complicated multitier system called Obamacare and will welcome a SPUN as a default position. So keep fighting so we can stop this terrible, terrible social experiment that hasn’t worked anywhere else on the planet. The first newsletter being disseminated as part of the state by state Anti-MOC Campaign is out! Please read the newsletter and offer any comments or suggestions for subsequent Newsletters and perhaps other action-items. CLICK HERE TO READ or see below. 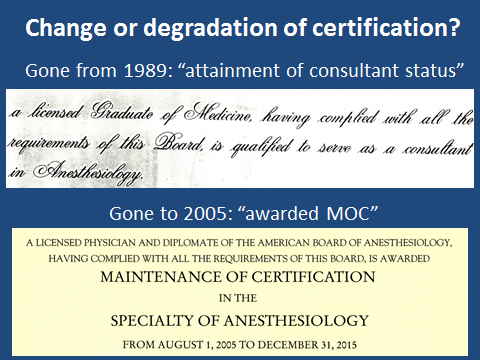 The “business of medicine summit” in October 2013 in Philadelphia will bring discussion on the matters of Maintenance of Certification, and possibly of licensure (MOL from the Federation of State Medical Boards). I have been personally and intensely involved in the battle of private physicians to expose the fallacy that this improves patient care in Ohio and nationally. An open discussion including open debate on this matter requires at least ONE opposing view presentation at such a meeting and the agenda does not include this important component. I would be honored to attend, present and actively debate in open forum with any of the ABMS/ABIM leaders, who continue to press this MOC program as “optional”, although the ABMS has actively lobbied congress to pass discriminatory legislation, which will effectively result in mandatory MOC participation to maintain hospital, employee, Medicare and multiple private health insurance participation. With over $336 Million in documented revenues (cumulative IRS 990 documents) from MOC in 2011, the ABMS is an industry monopoly utilizing regulatory capture to transform Board certification from a singular training outcome evaluation documenting attainment of consultant status, into an entry level document allowing participation in their corporate brand of “certification for profit”, repeatedly documented as unwanted by physicians and without a shred of outcome based science to validate any improvement in anything except ABMS corporate income. Alone the simple fact that the ABMS programs are only relevant in the USA and excellence in healthcare is widely available for less throughout Europe, attests to the fallacy of this monopolistic brand of purchased credentials-which is effectively mere “medical guilds” for those who chose to join and to promote exclusion of those how have not joined- as 1/4 of all practicing US physicians have never become board certified! I hope Medical Economics will support an open debate on these important matters in this Medical Economics sponsored meeting.